At the dawn of the nineteenth century, two very different magicians emerge to change England’s history. In the year 1806, with the Napoleonic Wars raging on land and sea, most people believe magic to be long dead in England–until the reclusive Mr. Norrell reveals his powers, and becomes a celebrity overnight. 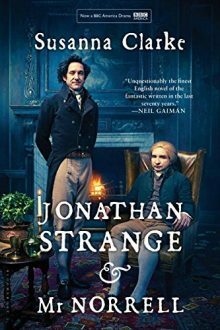 Yet the cautious, fussy Norrell is challenged by the emergence of another magician, the brilliant novice Jonathan Strange. Young, handsome, and daring, Strange is the very opposite of Norrell. He becomes Norrell’s student, and they join forces in the war against France. But Strange is increasingly drawn to the wildest, most perilous forms of magic, straining his partnership with Norrell, and putting at risk everything else he holds dear.